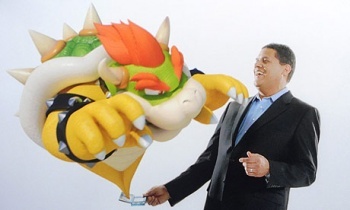 Super-low prices make people think that games are disposable, says the Nintendo executive. Reggie Fils-Aime, President and Chief Operating Officer for Nintendo America, has criticized the low prices charged for games on smart phones and similar devices. He said that the low prices were one of the biggest risks that the gaming industry faced at the moment. Fils-Aime thought that by charging so little for games, publishers were creating a "mentality" for consumers that games should never cost more than a few dollars. He also thought that it created a culture that content was disposable because it was so cheap. He didn't think that every cheap game you could grab on the iPhone or similar platform actually was disposable - he said that Angry Birds was a great experience - but he thought that that was the idea that cheap games were putting in peoples' heads. It's hard to argue with Fils-Aime's point, and it seems like the scenario he's describing will affect Nintendo more than it might affect Microsoft or Sony. While all three are now courting a more casual market, Nintendo has been the most successful in attracting new players that might never have picked up a console or handheld in the past. As there's some overlap in the audiences for the 3DS and the iPhone, it seems likely Fils-Aime is concerned about the impact the App Store pricing might have going forward. While it's certainly going to have an effect on the device, the fact that there are cheaper games on the iPhone isn't going to make the 3DS audience evaporate. What it might do, however, is make it harder in the future to convince people who didn't own a DS to invest in its successor. Of course, there's more to selling things than just the price, and Nintendo has shown itself to be very capable at convincing people to part with their cash.